This pen is made from wood taken from USS Constitution, the oldest commissioned warship afloat in the world. The wood was removed in 1973 as part of a refitting done by the US Navy. USS Constitution was launched in 1797 at Boston, Massachusetts, one of six frigates authorized by Congress to defend the trade of our young republic. Soon she was serving with distinction against Barbary pirates in the Mediterranean. Her greatest fame, though, came in the War of 1812. In that year, she defeated the British frigate HMS Guerriere in August and another British frigate, HMS Java, in December. 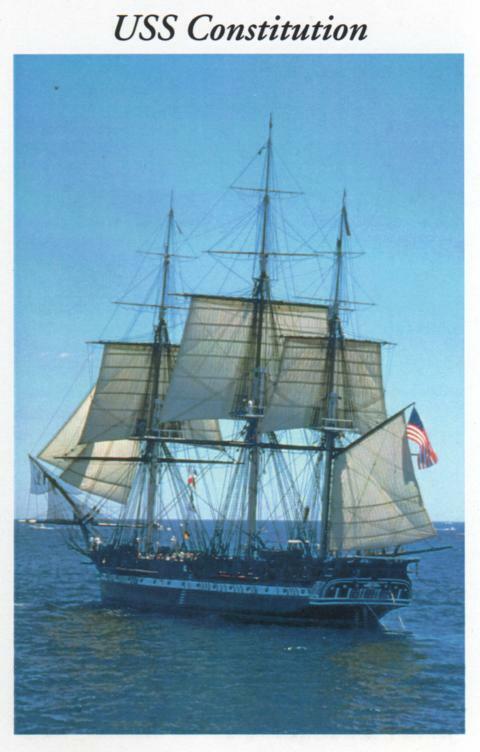 She also won the nickname "Old Ironsides", when cannonballs reportedly bounced off her thick oaken hull. Later in the same war she defeated HMS Cyane and HMS Levant in the same battle. In 1837, reports that the ship would be scrapped led to the publishing of a famous poem by Oliver Wendell Holmes. Constitution was refitted and continued to serve the nation as a naval ship and increasingly became a symbol of America's naval heritage. She was returned to Boston in 1897 in time for her Centennial celebration and has remained there since. To celebrate her 200th birthday, USS Constitution made history again. On July 21, 1997, she sailed under her own power for the first time in over 116 years. Huzzah for "Old Ironsides"!